The original Mary Mannakee quilt is in the collection of the Daughters of the American Revolution (DAR) Museum, and was made by or for Mary Mannakee of Rockville, Maryland in 1850-1851. To benefit the DAR Museum's quilt conservation efforts, more than 70 members of the Baltimore Appliqué Society worked together with the DAR Museum curatorial staff to produce the reproduction album quilt. This spectacular fund-raising quilt was so popular, that BAS members also created a pattern of the Mary Mannakee quilt from which DAR continues to produce income. The pattern is available from the DAR Museum Gift Shop. Included with the pattern is a fascinating history of the original quilt, details about the reproduction quilt and its patterns, and the numerous people who made it possible. I bought this quilt from a junk shop on D Street in 1916 for $6.00. It was hanging by one corner and was very dirty. I had it dry cleaned and then cut off the borders to make two pairs of drapes. These I used at the dining room windows when we lived at the Moore House in Yorktown, Virginia. The center I hung as a wall decoration. With a dark red floor, cream walls and trim, and old mahogany furniture, it made a beautiful room. Had Mrs. Catchings not saved the quilt, would anyone today know that Mary Mannakee ever lived? During its fifty years at the DAR Museum (also located on D Street), Mary's album quilt has been cleaned, sewn together, studied, photographed, exhibited, and published in various books and magazines. For years this was the only album quilt in the collection. Its charm lies partly in the folk-art quality of the appliqué and its fine technical execution. Several appliqué designs are original to this quilt and extremely whimsical: in particular the asymmetrical heart and the center cut-work appliqué squares. It is understandable that Marys quilt became an icon of the DAR Museum quilt collection. Thus, it was serendipitous when it was selected in 1996 by members of the Baltimore Appliqué Society to be reproduced as a fundraiser, with proceeds benefiting the DAR Museum quilt collection. The partnership between the DAR Museum and the Baltimore Appliqué Society is a natural one. The BAS mission of preserving appliqué quilts and the tradition of quiltmaking fits nicely within the National Society of the Daughters of the American Revolution (NSDAR) mission of preservation and education. Both organizations are dedicated to bringing quilts and quiltmaking to a wider audience. 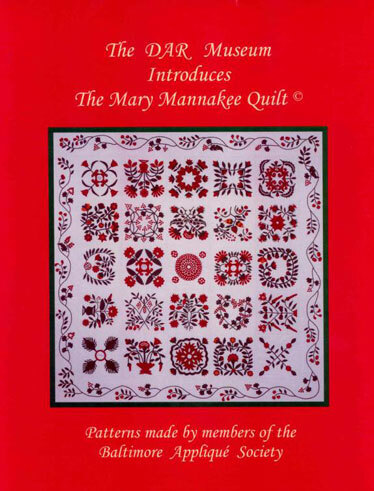 The Mary Mannakee story continues with the many quilts which have been made from these patterns. Many BAS members have made Mary Mannakee blocks for each other to complete their own quilts. Other quilt groups have followed suit, in varying color schemes and scale. Mary lives on!